Our wonderful jazz and Romare Bearden experience required me to be at Randall on a day I am normally at Huegel so it was a sub day for Huegel. Arcimboldo was an Italian painter and he is best known for his portraits made up of fruit and other miscellaneous images. Huegel students have done some work with identity this year so I wanted to build on the portraits they had done to do a silly one. Students cut images from magazines to create a self portrait. Each of my three classes at Huegel are very different from each other and have very different needs. But, as someone who is only there three hours a week, it is hard to differentiate my lessons to meet all of those needs. This is why I liked this lesson so much, all the same materials but meeting different needs and learning around one subject in many different ways. Let’s start with what each of these three lessons has in common: snowmen, perspective, oil pastels, sharpie and watercolor with salt. The first group of snowmen is from a second grade class who is able to listen and learn without much behavior difficulty. This class learned about perspective by learning about the horizon line, foreground and background. The second group has some difficulty with paying attention for longer periods of time so short lesson on perspective is what was needed. This group drew snowmen from the perspective of laying on the ground. 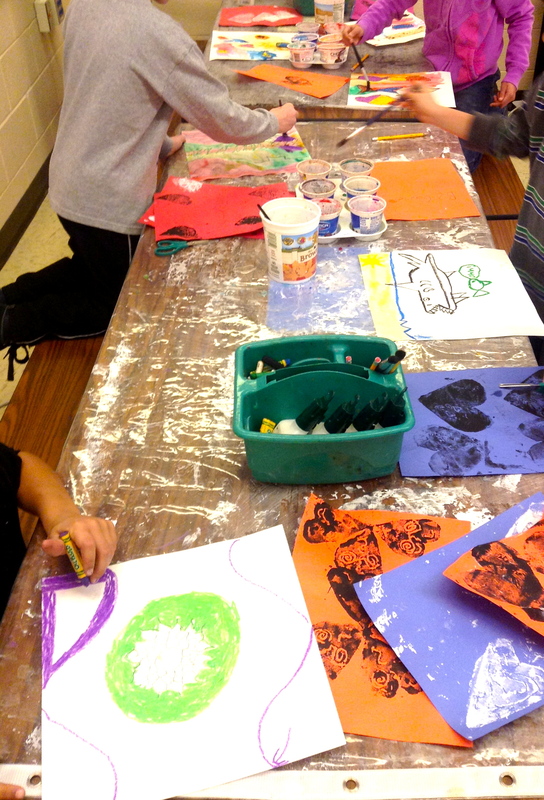 The third group is a third grade group and learned about perspective as well as overlapping and drawing off the page. I saw this lesson many places around the web but I first saw it at the art ed blog Splish Splash Splatter. Huegel third graders were learning about line symmetry in math class. Rotational symmetry comes up next and the second graders were just getting a head of the curve. I always hope that when I teach a concept earlier than their classroom teachers teach it, that when they see it in the classroom it makes more sense to them. We are all a team to support our students’ success! (Sometimes the art teachers are a forgotten part of that team). Anyway, this was a lesson where every kid felt successful AND a lesson where their math concepts were being reinforced. I call that a win-win! Some students choose to create one mandala and glue that on their background paper. Some students finished early and decided to create a second, larger mandala to attach to the back of their first smaller mandala with a brad. Their mandalas are now moveable art, they spin!